Amplifier is a signal amplifier device, in this case the amplifier to be made for home audio with the amplifier power output 150 watts. Amplifier for the simple room is generally equipped with a regulator of tone (tone control) in one box. Amplifier power capacity for the room should not be too big, because it is used to strengthen the signal in a room (home) only. Here are the steps in making the amplifier. Power amplifier is selected OCL 150 watt power amplifier. Kit 150 watt power amplifier there are many types in electronics stores, therefore need to have a good. OCL 150 watt power amplifier has more than enough power to amplify audio signals in a room (home). 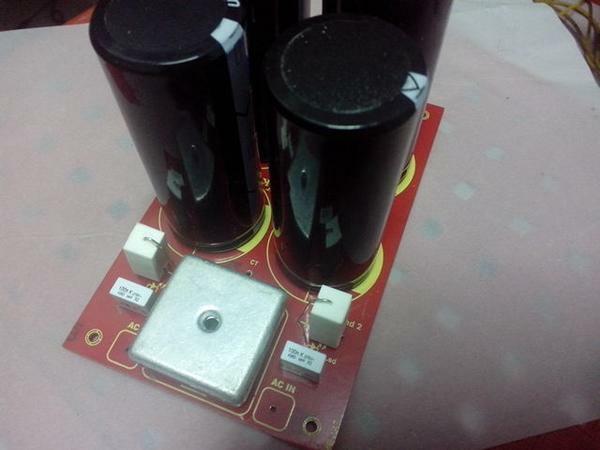 Here is a sample kit OCL 150 Watt power amplifier. Circuit 150-watt power amplifier OCL above is schematic to 1 channel, the OCL 150 watt power kit above is a combination of two pieces of OCL 150 watt power circuit such as the stereo kit. 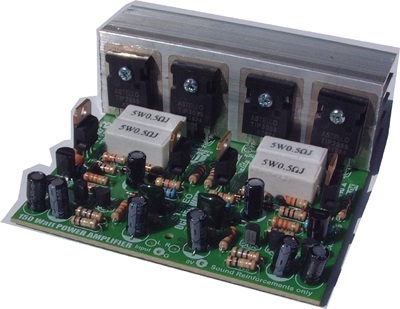 Tone control that can be attached to with a 150 watt power amplifier OCL there are many types, the most simple and has a good quality one tone control four transistors. Tone control transistor 4 have been selected control system baxandall tone and tone control working voltage equal to the voltage power amplifier, so do not need an additional power supply, in addition it's tone control is cheap to buy. 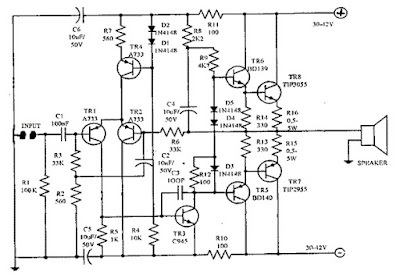 Speaker protector is a circuit that serves to protect the load speaker of surge voltage at output the power amplifier. In principle speaker protector works by delaying the time of interconnection between speakers with a power amplifier,, So that voltage surges power amplifier OCL when first turned on is not channeled to the speaker. 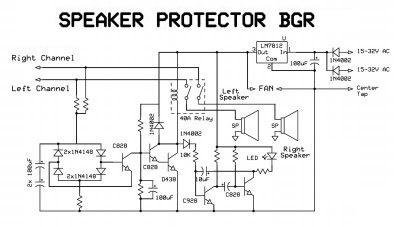 Speaker protector is good but may delay the time connection of speaker should also be able to decide quickly what if there is a DC signal at output the power amplifier. The following speaker protector kit that can be used. Kit is a stereo speaker protector, so that the path of output power 150 watts ampliifer OCL directly connected to the input speaker protector. 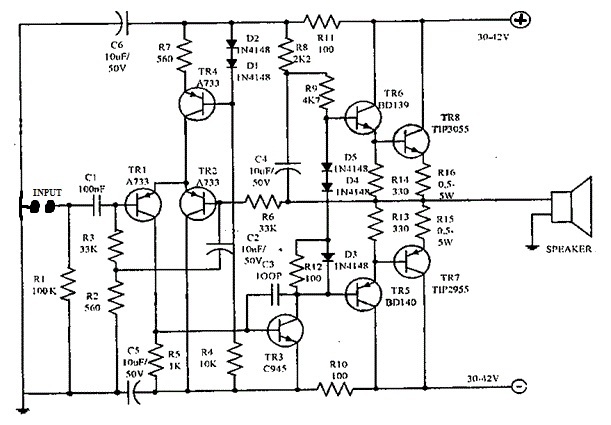 Here is a schematic circuit protector speaker above. 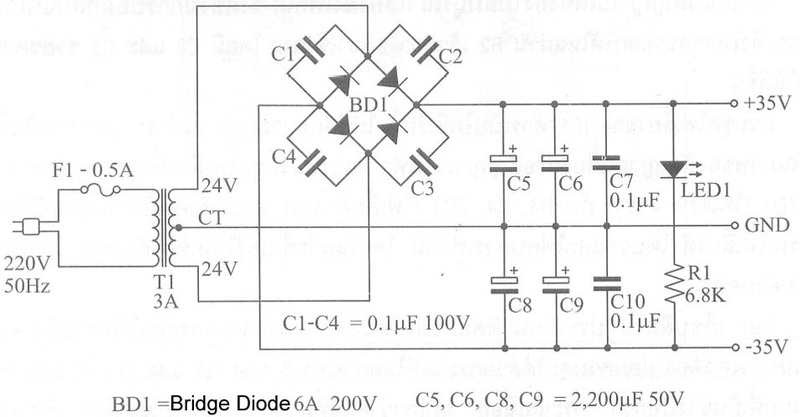 Power supply is needed to make this amplifier is symmetrical power supply with a current capacity of at least 5 Ampere and symmetrical output voltage 25-32 volts. For the transformer should have quality for the transformer that is not good in general can cause noise (hum) of the electromagnetic wave transformer. In addition it should have a transformer that provides extra terminal 500 mA or 1 A to provide a supply voltage to the speaker protector and fan. 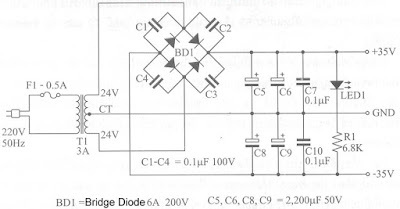 To the power supply kit to keep in mind is the capacity of the capacitor (elco) and the current capacity of the diode bridge. This is because if less large voltage drop will occur when the amplifier reproduces bass tone. How to assemble the amplifier in a box that needs to be considered is the layout of the transformer power amplifier kit power supply, fan and other kit for determining the cable lines and air circulation inside the box. Position the transformer should be because emit electromagnetic waves around the transformers, in addition to the weight. Position the fan power amplifier kit, it is important because it serves to regulate the fan air circulation, so that the heat generating components such as the transistor power amplifiers and transformers as much as possible to get priority gets smooth air circulation. The position of the tone control should be shielded from electromagnetic influences of the transformer (especially the input), it aims to avoid hum due to electromagnetic effects. Input cable lines as much as possible kept away from transformers and coaxial cable aar electromagnetic waves from the outside is not about the input signal amplifier. 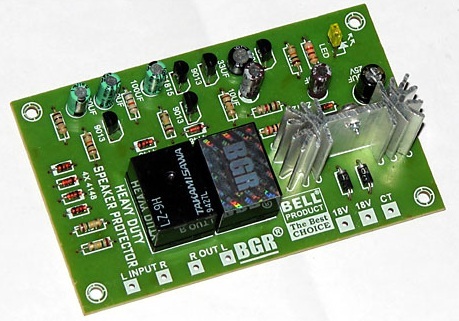 The grounding system in the circuit should be connected to a box, except the ground speaker protector should not be connected to ground power amplifier circuit,it aim for that can detect a speaker protector signal. Once the assembly process is complete, you should amplifiers such rooms home in test with lit without being connected to the speaker and the input signal, making sure all temperatures normal components and do not forget to measure the output line speaker amplifier with mutlimeter VAC (must be 0 volts) when no signal and no voltage DC at the output terminal. After all the normal loaud please be connected to speakers and audio signal supplied to the amplifier we just created. Hi, Sir! 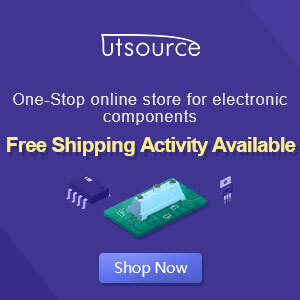 May I know if I can ask a PCB design layout that we can print already for us to do the circuit easily? Thank you and Hoping for your earnest response. hello, i will sent you an email. Okay mr Gopal, i will sent you an email. please check. sir do you have already PDF? all of this? please tell me your email. Wahyu Sir the BCP ptf send me-? Hi Sir , Im interested to make this, so can you please email me already PDF? all of this?. Hello, Im interested to make this, so can you please email me already PDF?